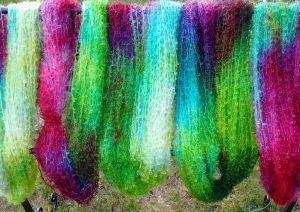 I have been busy dying yarns. They are in the dye pot, on the drying rack, on the clothes tree, and in the tree branches. The backyard seems to have yarn all over the place. Yarn, yarn, yarn everywhere. here is just a few photos of some of it….. 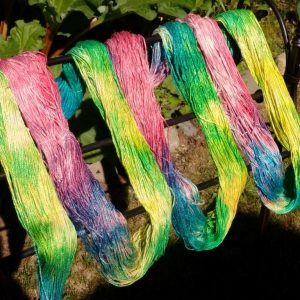 I do create my hand dyed yarn in a kettle. 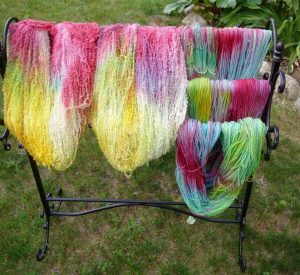 My style of dyeing is very serendipity since I throw stuff at the pot and see what sticks. Haha. Seriously, I do not do repeats so each dye pot is unique which is why I generally dye numerous skeins at once. This helps ensure to have a nice amount to use for my weaving projects or my next crochet fibet art piece. I have Boucle yarn, 2 ply Angora yarn, BFL yarn, 2 ply Silk Yarn, and even Baby Wooboo yarn…. Whatever will I do with all this yarn? Weave scarves, shawls…sell it in the shop? 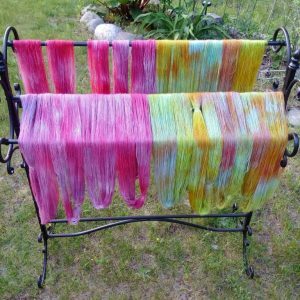 Make some Wearable Art Treasures, weave using the Triangle Loom, the Square Loom, the Rigid Heddle loom, or maybe even the new Diamond Looms I have coming…oh my…so many choices and whatever will I start with?